On Friday, truck driver Eduardo Munoz was just finishing a long day on the road when a road rage incident escalated into him being killed by multiple gunshots. Anthony Tillmon, the tow-truck driver who shot him, has been charged with first-degree murder and is being held on $3 million bail. If convicted, he faces a maximum sentence of life without parole. The tragic incident occurred last Friday on I-88 near the suburb of Oak Brook, IL. 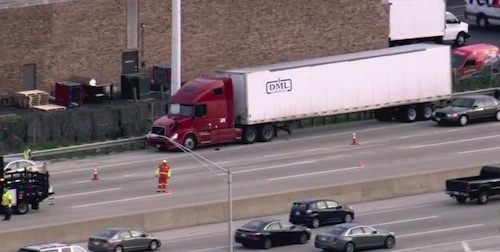 Prosecutors say that just after 4 pm, 43-year-old Eduardo Munoz of Northlake, FL was driving a red 2007 Volvo semitrailer truck east on I-88 when he encountered 34-year-old Anthony Tillmon, driving a tow-truck in the same direction. While it is still uncertain as to what started the argument, investigators say the two men had no prior ties before the incident. They found video surveillance from a toll plaza about three miles from where the shooting occurred and say it appears the argument started before they entered the toll plaza. “Several witnesses observed Tillmon and Munoz arguing and driving aggressively next to each other," DuPage County State's Attorney Robert Berlin told the court during Wednesday's hearing. 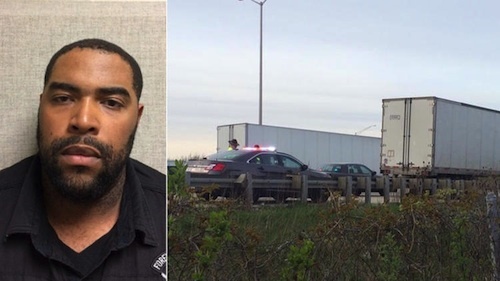 According to prosecutors, the fighting escalated as both men continued driving for about three and a half miles when Tillmon allegedly pulled out a handgun and started firing shots directly at the semi. Munoz was struck three times and was able to pull over to the side of the road at milepost 138.5 near the southbound ramp of Interstate 294. He was still alive when emergency personnel arrived on scene and transported him to Elmhurst hospital. Tragically, he was pronounced dead at the hospital approximately 90 minutes later. In the meantime, Tillmon fled the scene but it didn’t long before police were able to link him to the crime through surveillance video, I-Pass records and witnesses. They also found video surveillance from a Wal-Mart in Lansing, showing Tillmon’s parked tow-truck and him being picked up by his girlfriend. Berlin says police recovered a 9mm shell casing from the tow-truck and a green vest inscribed with Tillmon’s nickname, “Hank.” On Tuesday, Tillmon turned himself into authorities and was charged with first-degree murder. His attorney says he has no prior convictions, works full time and lives with his girlfriend and two adopted children. Berlin says that Munoz lost his life to a senseless murder but he still managed to save other people’s lives by pulling off the road. “Stopping in the middle of the road could have caused a tremendous amount of harm to the public,” he said, noting the heavy traffic at that time of day. “Him pulling off to the side absolutely saved lives.” Munoz had a truck driving job during the week, was a family man and engaged to be married. He was also an active member of his church community. “He was a person willing to do whatever he could just to help other people. He shined," says Pastor Larry Perez.